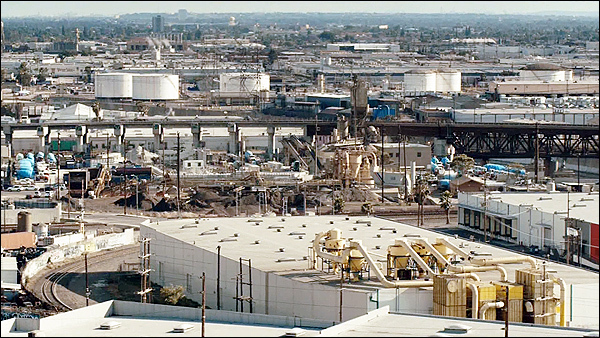 of the fictional industrial city of Vinci, California, where most of the action takes place. 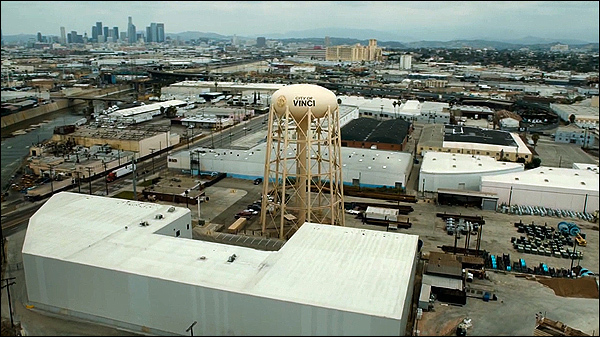 They start out at 9:54 with an aerial shot of the City of Vinci water tower. In reality, this is actually the City of Vernon water tower. They simply changed the sign. which is at 2800 S. Soto Street, in Vernon, California. 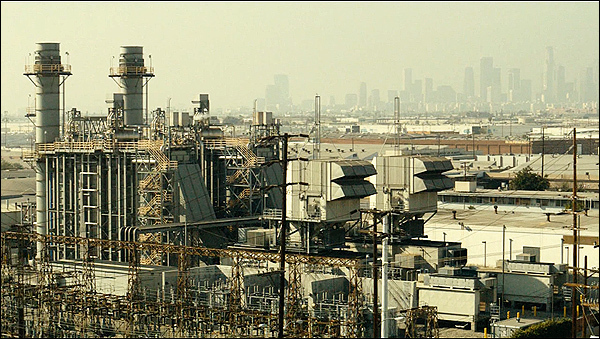 The city of Vernon is located about three miles southeast of downtown Los Angeles. inspiration for the corrupt city of Vinci. the Pilot Water Tower Cold Storage, at 2820 S. Soto Street. Here is a Google StreetView of the water tower. see in the distance is located (just east of) 4600 S. Santa Fe Ave, in Vernon. 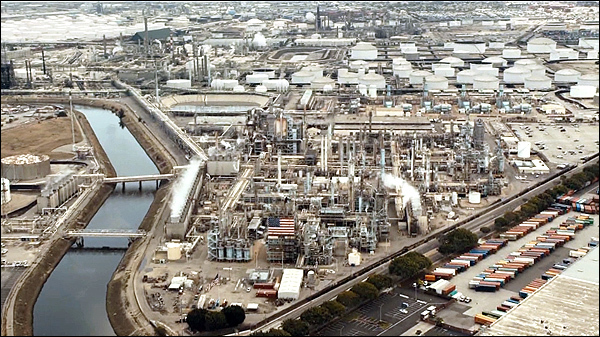 Here is a matching Google Earth shot of the plant. north of its city limits. (The Vernon water tower can be glimpsed in the distance). The large flat building in the foreground, with the yellow pipes at one end. 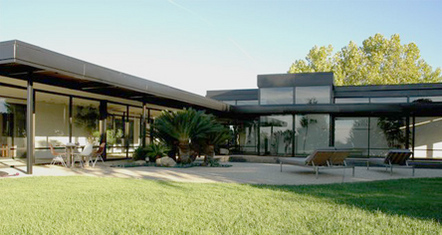 is located at 1614 Perrino Place, in Los Angeles. The camera is looking southwest. The building with a touch of red on it, next door, is 1625 Perrino Place. 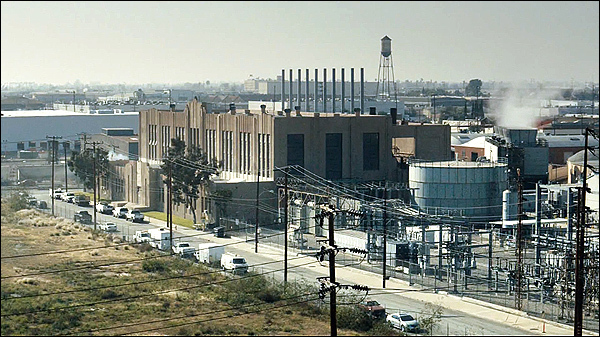 The bridge/trestle in the background spans the L.A. River, just south of Washington Blvd. Here is a matching Google Earth view of the spot. And here is a more down-to-earth StreetView. This is nowhere near Vernon. 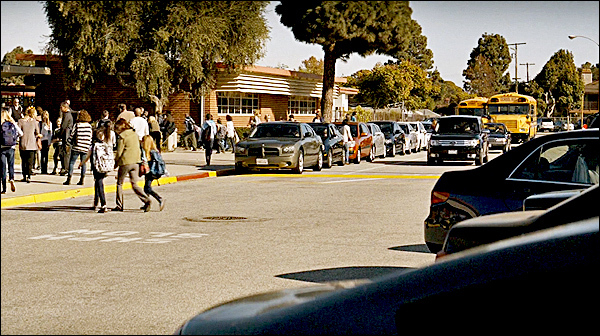 In fact, they traveled some 15 miles south, to the City of Carson, CA. just south of the San Diego (405) Freeway, in Carson. The camera is looking south from the corner of WIlmington Blvd & 223rd Street. The waterway on the right is the Dominguez Channel. Here's a Google StreetView of that flag as seen from Wilmington Blvd, in Carson. And here is a matching Google Earth aerial view. in the Granada Hills / Mission Hills section of the northern San Fernando Valley. The camera is looking south, right down the 405, from just north of the 118. Here is a matching Google Earth aerial view. And here's a Google StreetView of what it looks like driving south on the 405 there. the Harbor (110) Freeway and the Century (105) Freeway. The Harbor Freeway links downtown Los Angeles with the L.A. Harbor to the south. 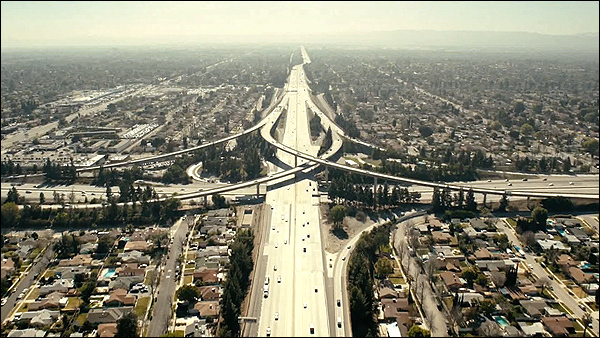 The Century Freeway leads west to Los Angeles International Airport. The camera is looking northwest (and almost straight down). looks like driving north on the 110 there. his son, Chad, at Mount Gabriel Elementary School. 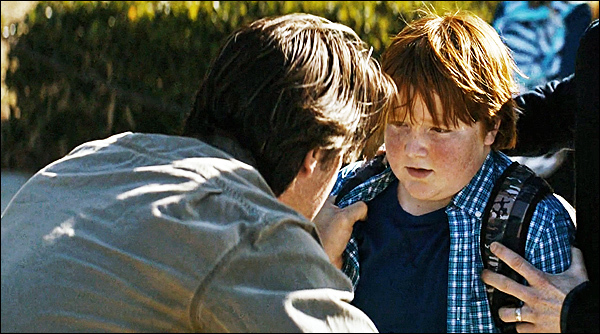 The boy seems uncomfortable around his father, and it isn't until later that we learn why. 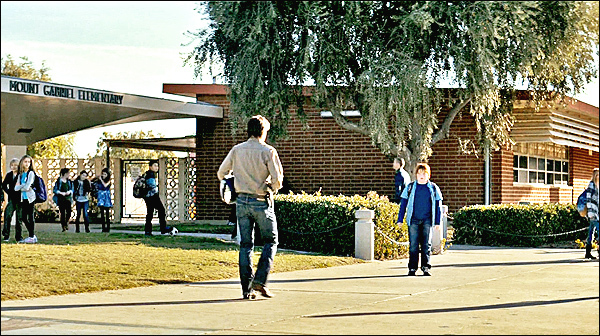 identify the kid bullying him, and threatening him when he hesitates. mother was raped by a man that Ray apparently killed. at 2125 Lincoln Ave, in Torrance, CA. that is basically an extension of the west end of Lincoln Ave.
For the uninitiated, Torrance is a mostly residential city in the South Bay region. and the Palos Verdes hills. This location is about four miles inland from (east of) the beach at Redondo. 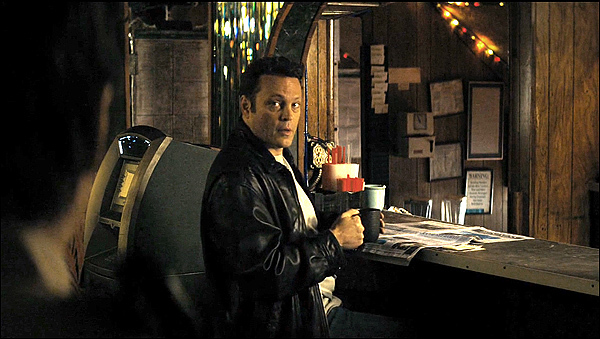 'Frank' (played by Vince Vaughn) and 'Ray' (played by Colin Farrell). 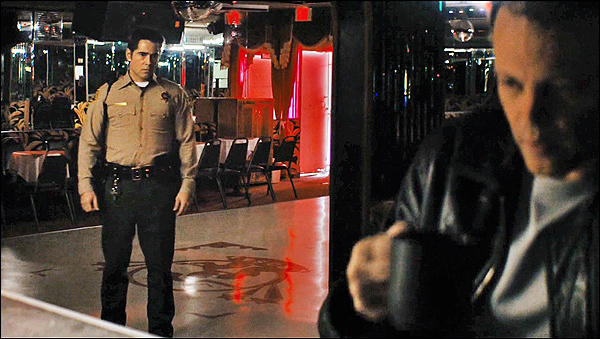 In the scene, Ray enters a dark club, and finds Frank sitting at the bar. Ray has come to get information from Frank about the guy who raped his wife. he might eventually want something in return. taking orders and beating people up who upset the City of Vinci. at 1010 E. Cesar Chavez Avenue, in East L.A.
you can see the same round symbol that is also on the La Zona Rosa sign. 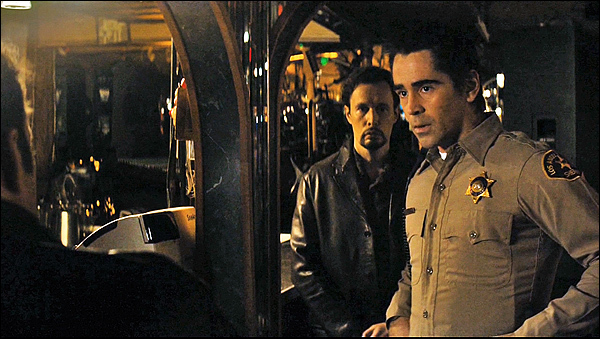 Frank is a former mobster, turned casino owner, in an effort to go legit. 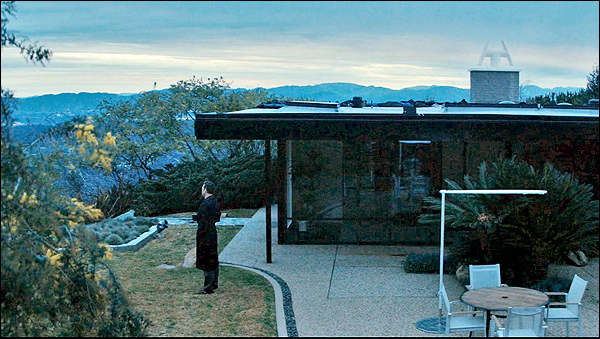 And it's a very nice, very expensive place, a modernist mansion, perched on a hilltop. 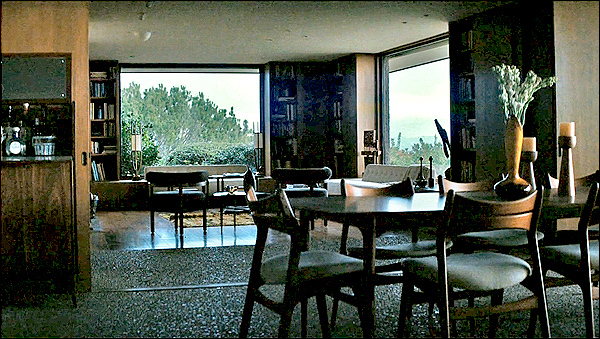 This is 22035 Saddle Peak Road, in the Topanga hills above Malibu, CA. John Kelsey & Thornton Ladd, who created the Norton Simon Museum. 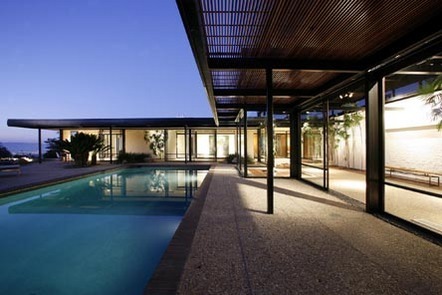 It was listed for sale recently at $6 million. Here is a Google StreetView of the road leading up to the house. 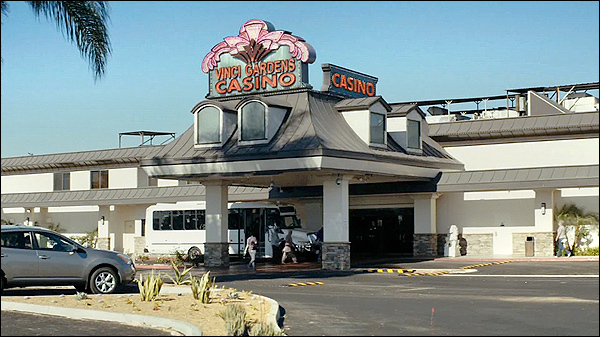 At 10:08, we see Frank's "Vinci Gardens Casino". 1045 W. Rosecrans Ave, in Gardena, CA. club in Los Angeles County where you could gamble legally. doesn't have a sign on top (just a big one out by the street). 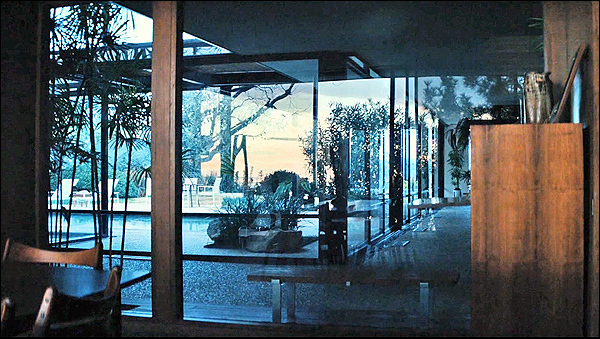 The Interior scenes were also shot here (at least some of them). Here is a Google StreetView of the Normandie Casino. second version was ridiculously difficult. I checked every gambling casino in the L.A. area, and none of them matched. that it seemed to be right next to a freeway. So, I began looking at every Honda dealership in L.A., but I still didn't find it. Eventually, I went to the Honda website, and got their official list of dealerships. of that Honda list. To my surprise, it wasn't in L.A. - it was way up in Ventura, CA. 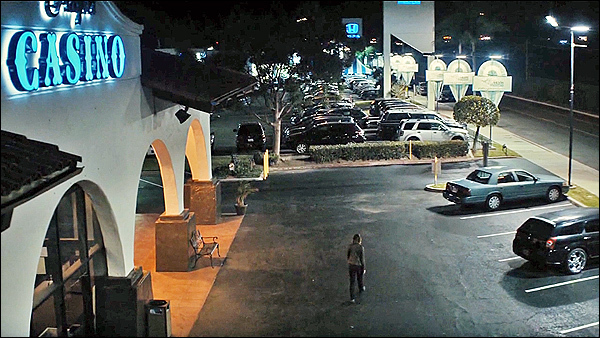 This turned out to be the Player's Casino, at 6580 Auto Center Drive, in Ventura. and about 40 miles west of the Malibu Pier. 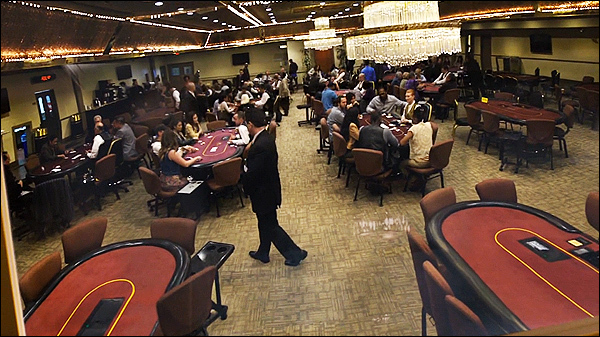 Here is a Google StreetView of the Players Casino. 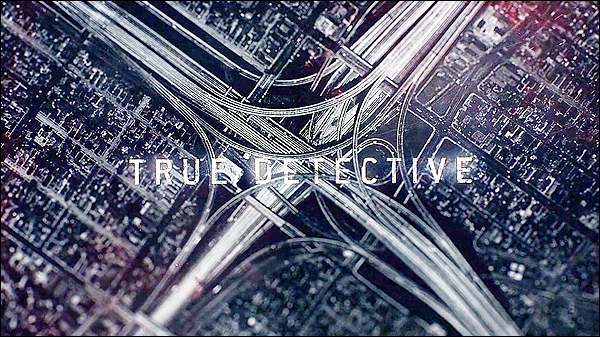 More "True Detective" Locations! Just click below. 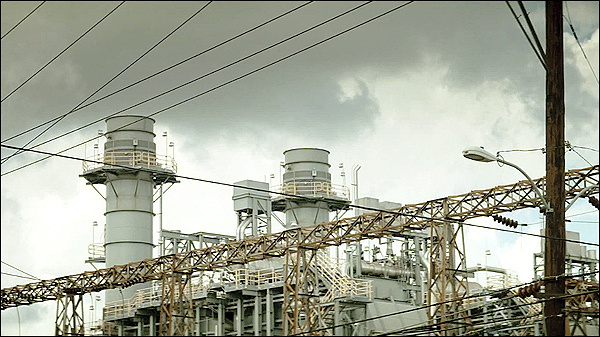 The photos on this page are stills from "True Detective - Season 2"
(which you can buy by clicking here) and are copyright Showtime.